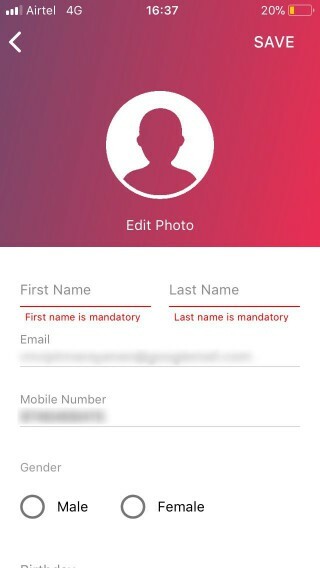 I'm designing an mobile app for both iOS and Android, which includes a form. 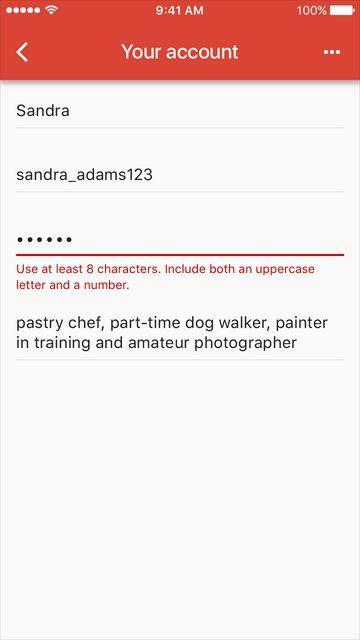 The form has several required input fields that the user needs to complete before continuing. If the user clicks Continue before typing in everything required, an error message would pop up under the field. All okay so far. But, according to the iOS developers on my team, it's impossible (or at least difficult) to make something appear in the layout that pushes the rest of the content down. This is not a problem on Android apparently. Is this really a problem when developing for iOS? Should I make space for the error message below the input field, before it's displayed? Are there any other good solutions to displaying the error message, that doesn't push the content down? Here's a screenshot to showcase my problem. I've also made an example where I have reserved space for the error message, but I don't think it looks pretty good to have so much space between the elements, when it's not gonna be consistent throughout the app. I disagree with @colmcq. Giving space for error messages, that might come in like 10% of the cases is not at all a good option. 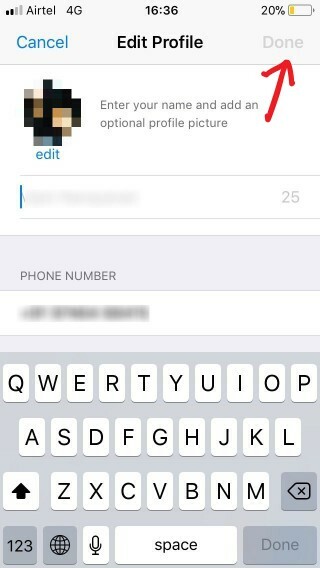 Actually, it is not Impossible or difficult to show the form validation messages as you have shown in option 2. Many apps use that method only. 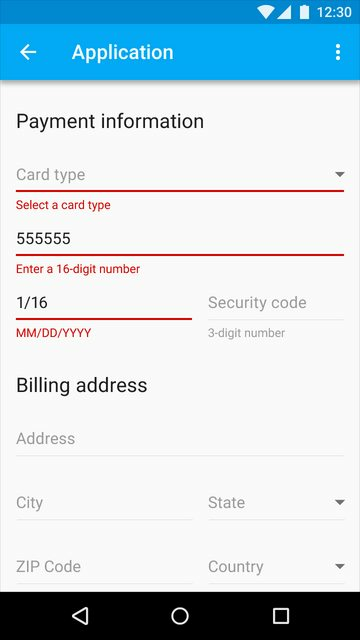 - You might find some useful information here: https://www.davidbritch.com/2017/03/validating-user-input-in-xamarinforms-iv. Showing error message below an input field is one of the most common practices. 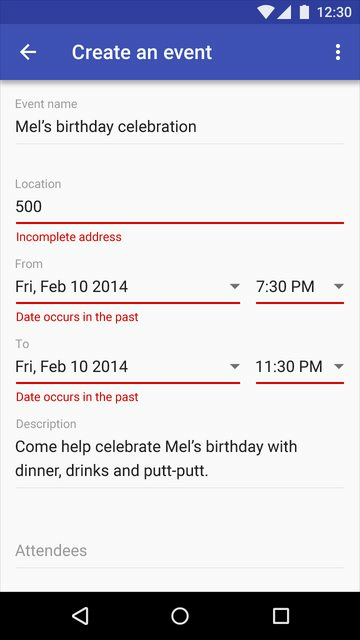 Google's Material Design also recommends the usage of this method. In iPhone different methods are used to show these error messages. Some of them are listed below. 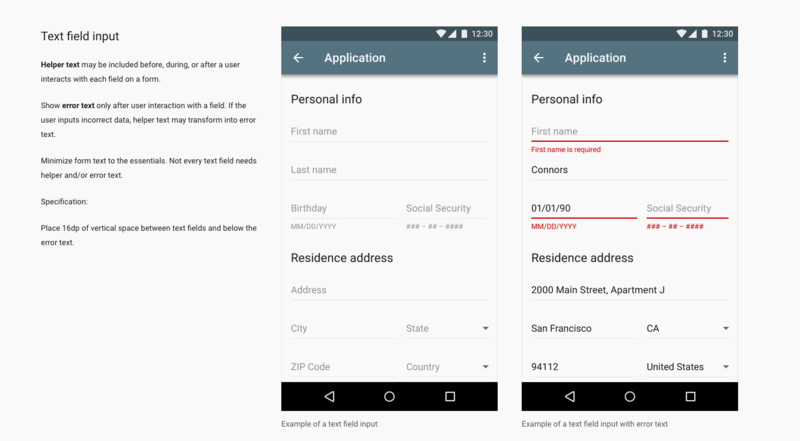 Just take a look at the Material Design Guidelines. I understand you use a classic style, but you can apply the same solution. Text field input Helper text may be included before, during, or after a user interacts with each field on a form. Show error text only after user interaction with a field. If the user inputs incorrect data, helper text may transform into error text. Minimize form text to the essentials. 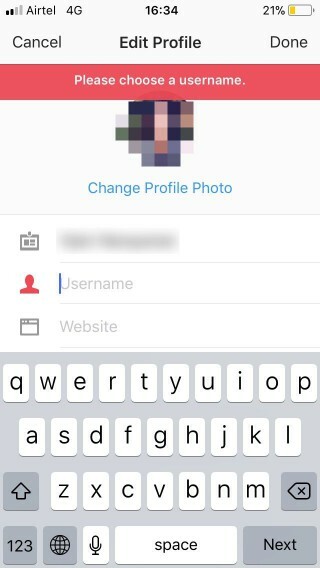 Not every text field needs helper and/or error text. Place 16dp of vertical space between text fields and below the error text. on our last project we have used tooltips to show error messages. the reason was that we used long forms, and the shown error messages created emtpy spaces that devided logical components. Not the answer you're looking for? Browse other questions tagged user-expectation input-fields error-message validation or ask your own question. Should I empty the wrongly filled fields or leave as user has filled after validation message?